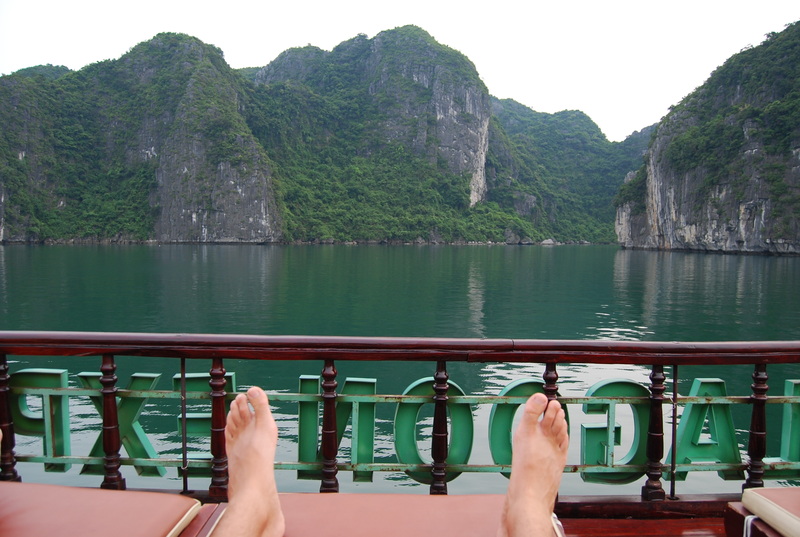 On any extended visit to Hanoi, a visit to mysterious Halong Bay, with its 3,000 limestone islands jutting into the Gulf of Tonkin, is a must. Although we got a taste of this beauty while on the beaches of southern Thailand, we had heard such rave reviews of this Unesco World Heritage Site that we booked an overnight tour aboard the Lagoon Explorer that left this morning. 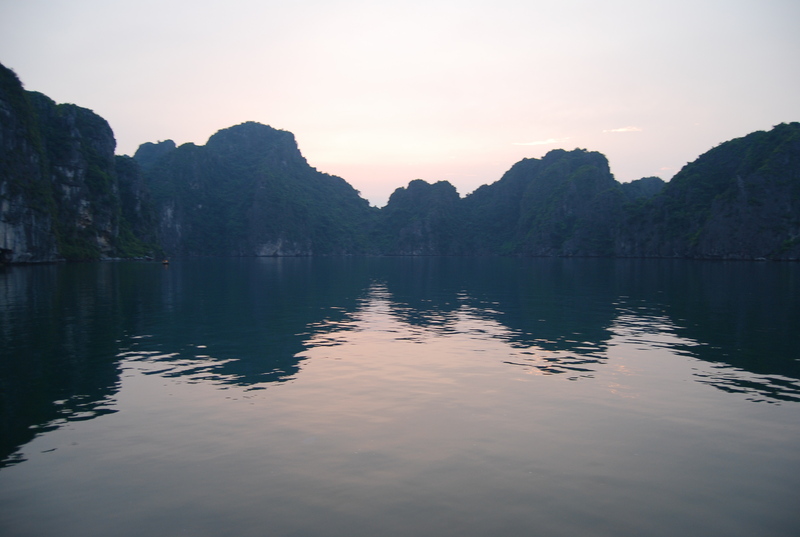 A 3-hour transfer, which included a stop at either an arts & crafts village or a sweat shop, brought us to Halong City, an overdeveloped eyesore, where we were quickly herded onto the boat. 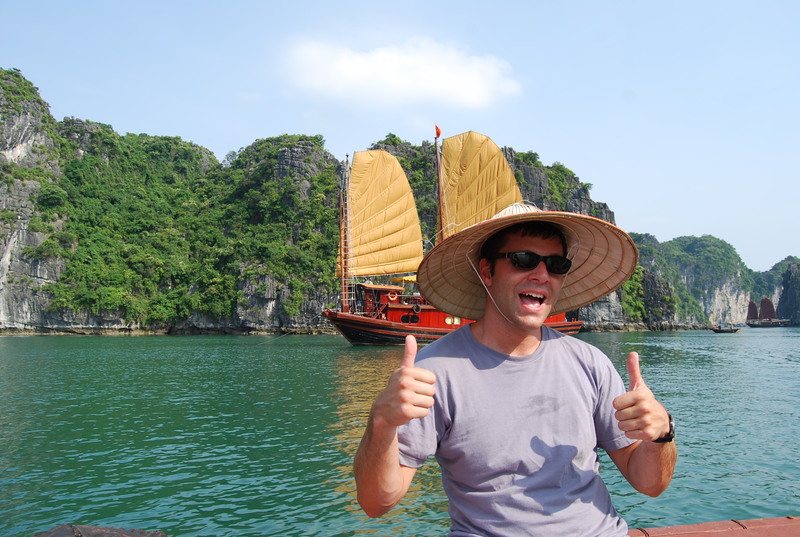 The crew welcomed us aboard the highly lacquered replica junk boat, at which time we realized that there were only four rooms, of which we would have three. The last was taken by a great Aussie couple — who actually didn’t seem to mind being with a bunch of young American guys. After being treated to a delicious seafood lunch, we picked up anchor and began our tour through the emerald and tranquil waters of the Gulf. 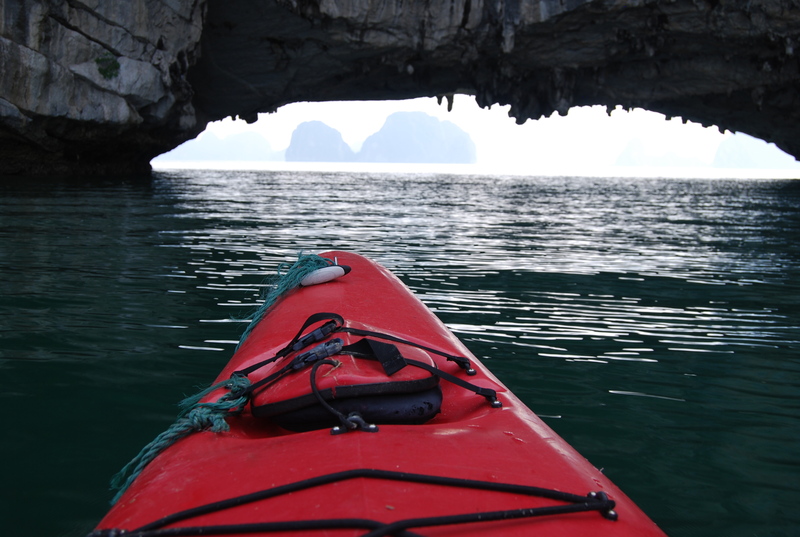 We passed through some amazing coves while sweating profusely on deck. Several hours later, we were desperate for a swim. At Cua Van, a floating village, we were given the opportunity to go kayaking — nothing like 100-degree weather to make you appreciate a post-exercise dip. Around 6 p.m., we moored for the night in a placid lagoon. Thankfully, the sun gave us some respite and we had the chance to hang out on deck again and take in our pretty spectacular surroundings. 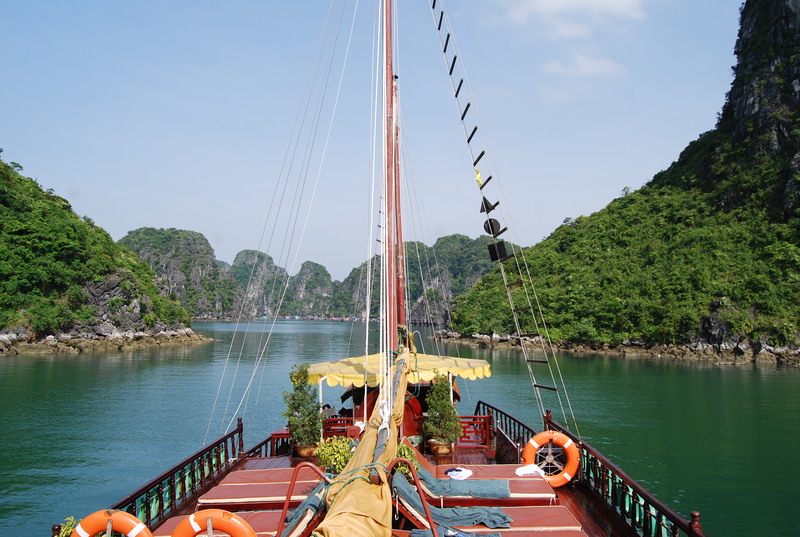 Being on a boat like this in Vietnam in late June certainly gave Aswan a run for its money as the hottest day of my life. And, although the clouds infringed on our sunset, we happy obliged if it meant cooler weather. We gathered everyone up for a big pre-dinner game of Uno! (of which your author was victorious) and then chowed down on some barbecued meats and seafood. The food was quite good. After dessert, an obscene lighting storm rolled in and we sat outside debating what might happen if our mast were struck. The humidity was still pretty unbearable, so we retreated to our air-conditioned sanctuaries for some sleep at around 10 p.m. — perhaps my earliest bedttime in 75 days.